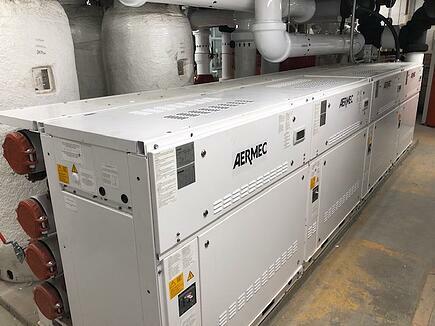 Aermec WWM units are installed for their ease of installation, high efficiency, redundancy, and small footprint. As you can see from the pictures, the mechanical room is very cramped and yet the WWM units have plenty of space. The units require service or maintenance space only in the front. 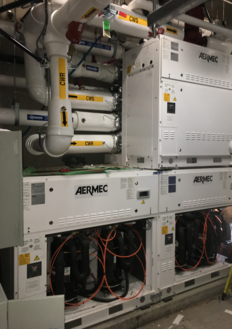 In fact, any module may be isolated and removed for maintenance while leaving the rest of the modules in operation. The modules can be linked together side by side, back to back, and stacked to reach a capacity of 960 tons. No clearance is required on the top, sides, or back. That’s the WWM.